RCES is a condition where the surface layer of the eye (corneal epithelium – see diagram) becomes unstable. The surface may then break down to form an erosion or abrasion. This may occur spontaneously or in response to minor trauma. The erosion exposes the nerves that lie just beneath the surface, between the epithelium and the stroma. RCES causes pain, foreign body sensation, sensitivity to light and watering of the eye. This is often worst first thing in the morning, and settles over 15 to 30 minutes. If a large erosion occurs the pain is worse, and may take several hours or days to resolve, and vision may be affected. RCES happens when the epithelium is not strongly enough attached to the underlying tissues. Normally, strong tissue strands anchor the epithelium through Bowman’s layer into the stroma. If these are not present, then the epithelium becomes unstable, and RCES results. Previously normal cornea. If the cornea is injured, e.g. scratched by a fingernail, then the epithelium rapidly grows to cover the scratch, and the initial pain gets better. Usually the new surface rapidly grows new anchors and no further problems arise. If they do not form quickly or strongly enough, then RCES results. Previously abnormal cornea. Some corneas have weakly anchored epithelium, mostly commonly due to a genetic defect called Map-Dot-Fingerprint Dystrophy (or Cogan’s microcystic dystrophy or Epithelial Basement Membrane Dystrophy). Sometimes it runs in families, but often does not. Eyes with this condition may develop RCES after an injury, or it may occur spontaneously. The main treatment for RCES is ocular lubrication, to reduce friction between the eyelid and the eye. This usually involves ointments at night and drops or gels during the day. They may need to be used very frequently when symptoms are bad: if drops are being used more than six times a day then preservative-free preparations are better for the eye. These are soft contact lenses inserted to protect the corneal surface from the mechanical trauma of eyelid movement. They are usually worn continuously for as long as six months, with the lens being replaced every four weeks. They are very effective at reducing symptoms, and may improve healing rates, but have the risk of causing serious corneal infection. Anyone with an extended-wear contact lens in place who develops pain, with a red eye or reduced vision should attend the emergency eye service the same day in case they have an infection. If lubrication alone does not heal the eye, then micropuncture may be recommended, particularly where the area of RCES is localised and not over the centre of the pupil. It is performed as a day-case procedure using anaesthetic drops to numb the eye. Multiple tiny stabs into the cornea are performed, aiming to reach the front quarter of the stroma. It creates small scars that help replace the missing normal epithelial anchors. This technique may be used in localised or diffuse disease. The unhealthy tissue is removed and strong alcohol applied to the cornea to clean the underlying tissues. 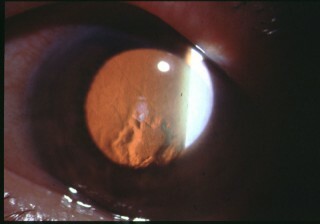 The cornea is usually more stable once it has healed over the clean corneal bed. The eye is painful for 2-7 days after surgery, and delayed healing is a significant possible complication. For eyes that have failed to respond to the treatments above, it may be necessary to consider PTK. The laser cleans off a large area of epithelium and anterior stroma which than heals with some scarring, and usually, a more adherent epithelium. PTK may cause slight haziness of the cornea, and a change towards a long-sighted glasses prescription. What is the long-term outcome of RCES? 90% of cases resolve eventually, although it may take several months, and some patients continue to experience occasional early-morning foreign-body sensations in the eye for longer still. It is important to continue using lubricating ointment last thing at night for six months after all symptoms stop. Bandage contact lens and surgical treatments probably do improve cure rates, and may speed up recovery, but because of their unpredictable success rates, and the possibility of complications, it is usual to try lubrication alone in the first instance. Where there is a pre-existing corneal abnormality, such as map-dot-fingerprint dystrophy, or the patient has a condition such as diabetes that may impair healing, the cure rates are lower and take longer to achieve.